Oh my gosh. . . Beautiful! I spent the last few nights backing up photos to CDs after getting a memory message on the computer. FREAKED. ME. OUT. I feel better now. . . . I used iPhoto to categorize pics by themes. So I had school programs, karate (then separated by belt color), flowers, holidays, and then other discs for just Chan or just Adri, and still others for favorites. Overlap, for sure. But it suits my jumbled brain and if I am looking for *that picture* I’ll have a few places to look, lol! Just gorgeous, MaryJo! Love all the sparkle and the Crystal Effects! Very cool! You can not delete those babies! My suggestion is an external hard drive! You can keep em all in one handy spot AND back up the other important files on your pc! Mary Jo, this is absolutely delectable! Beautiful, beautiful colors…and as always, the details are just amazing! 🙂 About the pictures….sigh….I am definitely in the same boat. Ugh!!! I always get enough off that it keeps the computer running…LOL…but it is still almost full! It freaks me out though…cuz I keep thinking about what if something would happen and I lost them all! You have inspired me to get busy backing them up! Gorgeous, gorgeous, gorgeous! I love everything! Especially the CE’d flowers on the background, the candles peaking over the first circle, the colors, the paper, the scalloped edge….okay…like I said. I love everything! We have an external harddrive. Rick usually backs my pictures up with it and burns them on a DVD as well. Makes me hungry for cake! I always love all your details!! This card is totally yummy!! 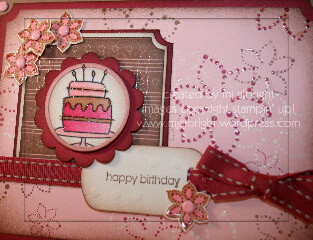 Love how you accented the designer paper with the CE, Mary Jo — beautiful colors for a beautiful card! Great cake stamp, too! This is a gorgeous card MJ – you really rocked this sketch! I love all the colors, and the sparkle! I’m with them – an external hardrive is the way to go – they are relatively inexpensive and they have TONS of space on them! I have all my pictures on my hard-drive saved by date and brief description of what’s in that file (for that day). I then back up all photos in my external drive that has like 300 GB, so it has plenty of room. Once I’m done with the pictures I’ll delete them off the computer hard drive. I’d like to get another external hard drive so that way i can save to both and keep one in our fire safe. I don’t save on cd’s any more because I’ve had them not work when I try to go back to it, so I’ve lost pictures. You can also find a website that you can upload to and then if you have a fire/computer breaks then you can get the pictures from online. But, so if I’m looking for a picture, I just have to know around what date it was taken and then just look through them. Mary Jo, you are such an inspiration! I love your projects, they are always so beautiful. Beautiful card. I’m just starting to stamp and loving all these beautiful cards you do. As for the computer and storing your pics….I just backup to a disk and then make a thumbnail print of what is on the disk and put it in a notebook in a folder that stores cd/dvd’s and copy/photo paper. Has worked for me, as I can see what is in the disk with putting it in my computer. Hope my little idea helps. 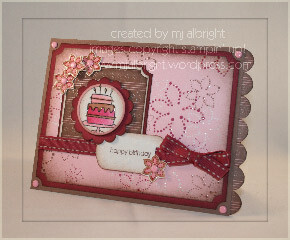 Beautiful as always…not sure how you think to add all of the details to your cards! One thing to help you save a little space is to save the files you have already changed and perfected with Photoshop at jpegs so the file size is smaller. Photoshop files are gigantic!! So if you keep all of your pictures as photoshop files, you will run out of room very quickly! So I have been opening my files in Photoshop (I have Elements), making my changes and if I know I don’t plan to use that file again, I save it as a jpeg…I have a folder for each year and then folders in that for each occasion or event. Elements has an organizer in it which is good, but I am so used to my system, I don’t think I will ever fully adopt it. Creative Memories(home based scrapbooking co.) has a very simple but marvelous computer program that organizes and backs up your photos. I really don’t like the computer but I love this program. Go to their website–creativememories.com to find a consultant near you. Good Luck!